Robert Roy Walker, 95, graduated into eternal life on Monday, February 4, 2019 at Hospice of the Panhandle in Kearneysville, WV. Born on September 4, 1923 in Winchester, Illinois, he spent the last 59 years in Clearwater, Florida raising his family. 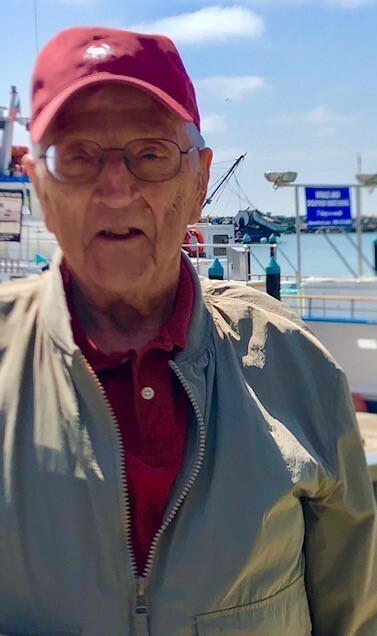 He is survived by his children, Thomas Walker of Roseville, MI, Kenneth Walker (married to Diane) of Martinsburg, WV, and Lynne Gray (married to Tom) of Mission Viejo, CA, five grandchildren, and one great-grandchild. He was preceded in death by his spouse of nearly 71 years, Dorthylee “Dot” Walker. “Bob” was a WWII and Korean War veteran, serving in the U.S. Army Air Corps and the U.S. Air Force as a pilot. He was a packing and receiving office manager for many years followed by several small business ventures before retiring. He loved to boat, fish, play with his beloved dogs, and spend weekends RVing. Most of all he loved to support his family’s activities, such as, Scouting, roller skating, band, and camping. Bob and Dot will be inurned together at a later date. In lieu of flowers, memorial donations can be made to Trinity United Methodist Church, 220 W. Martin Street, Martinsburg, WV 25401, Hospice of the Eastern Panhandle, 330 Hospice Lane, Kearneysville, WV 25430, or a charity of your choice.